New seekers and those curious about the Wiccan path are often overwhelmed by the vast and contradictory information they find on the subject. In this accessible, straight-forward e-book, Wiccan High Priestess Kristin Barton explains important information that is often left out of Wicca 101 books so that new seekers can save time and frustration as they discover basics. 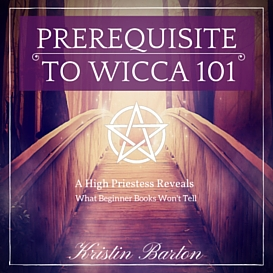 Learn what defines a Wiccan practice, become aware of common misconceptions that beginners often believe, discover how to approach Gods and Goddesses, learn what comprises a full Wiccan ritual with all of the formal rites and their meanings, learn the tools of Wicca, and get insider information on why many of the Wicca 101 books you find contain whitewashed and partial information. This book addresses the basics of spell craft, the real value of initiation (whether it's right for you or not), and how to stay safe and balanced energetically when doing workings and rituals. Ethics for beginners are discussed, as is Pagan culture and approaches to relationships of all kinds. Learn about where solitary practitioners can find classes and rituals to attend, how to find healthy groups and qualified teachers, and how to spot unethical and toxic groups. The bonus material, worth the price of the book, has oodles of resources from book recommendations to reliable online study options (some entirely free) to where to find Pagan festivals. Also included is a full self-dedication ritual, a section on how to build a useful and organized Book of Shadows that saves time, frustration, and money, and a glossary of terms. This e-book is a must-read for any new seeker or solitary practitioner!